NEW YORK – July 31, 2018 – The Partnership for Drug-Free Kids, a nonprofit that supports families whose son or daughter is struggling with substance use, is proud to announce its participation in the 2018 TCS New York City Marathon as an official charity partner. The race will take place on Sunday, November 4, 2018. Fourteen runners comprise the charity’s Partners for Hope Team. This volunteer group, many who have a personal connection to the organization’s mission, will run to raise critical funds that will help the Partnership create new resources and expand its evidence-based and customized services for families. Georgia Lenas [St. Petersburg, Florida] – Georgia Lenas will run in honor of her cousin, who passed away after a long, hard-fought battle with substance use and addiction. Georgia shared that she is inspired to run to help prevent other families from going through the pain of losing a loved one to an addiction. “I am running to honor my cousin. Last year, 50,000 people lost their lives to drug overdose and these numbers are only rising. I want to help families just like my own find the support and resources they need during these difficult times. Please consider donating and joining me to help families find the hope and healing they deserve, while spreading awareness of the devastating effects of drug use,” said Lenas. Maddison Lange [Iowa City, Iowa] – Maddison Lange, the 2018 Miss Southeast Iowa, has two family members who have struggled with addiction. Lange also authored a children’s book “Petunia and the Peculiar Candy,” which helps parents educate their kids about the risks associated with prescription medication abuse in order to start conversations at home. “I spent my childhood going through experiences that no child should. My goal is to help educate and raise awareness about substance use and addiction as a Partner for Hope for the Partnership for Drug-Free Kids,” said Lange. Erin Day [Wilson, North Carolina] – Erin Day is the Director of the Wilson County Substance Prevention Coalition in North Carolina and the Partnership’s mission is one that is close to her heart, both personally and professionally. “I have been working in substance use prevention for 10 years. I am a recovery ally and my mother will celebrate 10 years in recovery this year. I want to run this race to raise money for access to services and support and to recognize what running has meant to my mental health through my work and personal experiences,” said Day. “I run for peace and healing. I believe people recover and families heal. My reason for running the TCS New York City Marathon is to test my love of running and to support the idea that a healthy mind and body is for all,” said Day. Amelia Isabella [Wakefield, Massachusetts] – Amelia Isabella works as a social worker and has already completed several marathons in memory of her older sister, who passed away unexpectedly 10 years ago. She found healing by running and shared that she is excited to help others find hope. “Since my marathon journey started the year my sister died, when I ran Chicago for a children’s charity, I decided there was no better way than to run this marathon for a charity. In keeping with the tradition of running for kids who are struggling, this year I am running the marathon with this charity in hoping for drug-free childhoods and families,” said Isabella. Jeanette McCue [Worcester, Massachusetts] – Jeanette McCue works as a care manager and has witnessed firsthand the impact substance use has on families in both her personal and professional life. She says she is running to be a part of the solution. “I work in the behavioral health field, including working with individuals with dual diagnoses. I know the importance of having access to treatment can mean for a person’s success in recovery. Personally, I also have seen the devastation that untreated substance use disorders have caused my close friends and family. I am honored to help raise money for parents who have children struggling with addiction,” said McCue. 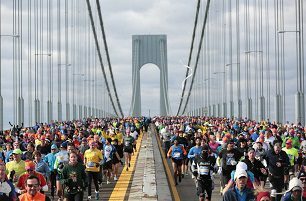 The TCS New York City Marathon has grown from a Central Park race with 55 finishers to the world’s biggest marathon, with more than 50,000 finishers in 2017. More than 350 official charity partners will be part of the 2018 TCS New York City Marathon, providing thousands the opportunity to run in the world’s most popular marathon. The Partners for Hope Team raises critical funds on behalf of the Partnership for Drug-Free Kids, the only nonprofit organization dedicated to helping families struggling with their son’s or daughter’s substance use. Every dollar raised on behalf of the Partnership will ensure that the nonprofit’s free, family support resources, including a Parent Helpline, one-to-one Parent Coaches, online tools and community education programs, can reach those who need them most. Help make their collective efforts a success by supporting a Partners for Hope Team member, or by donating your time on race day with the Partnership for Drug-Free Kids volunteer team. To learn how you can participate as a volunteer, please email mailto:fundraising@drugfree.org.